When it comes to musicals, I guess you could say I’m something of a purist, having been raised on musical recordings and Hollywood films of Broadway shows from the genre’s ‘Golden Era’ originally penned by Rogers and Hammerstein in the 1940’s and ‘50’s (Oklahoma, Carousel, South Pacific, The King and I, and The Sound of Music), and Lerner and Lowe in the ‘50’s and ‘60’s, (Brigadoon, My Fair Lady, Camelot and Gigi). From there, it was an unnatural, but nonetheless exciting progression to the more daring West Side Story by Leonard Bernstein, with lyrics by young Stephen Sondheim, the film of which premiered in 1961. At the time, that particular show was preferred by my older, teenage siblings rather than my mother who thereafter, lingered on a bridge of sorts between the aforementioned classics and more experimental musicals to come, beginning with the more traditionally melodic Hello Dolly, (1964) written by none other than Jerry Herman. Herman is the composer who is also known for creating some of the greatest musical theatre heroines of all time such as Dolly, Mame and perhaps, his most spectacular creation of all – Albin, a.k.a. 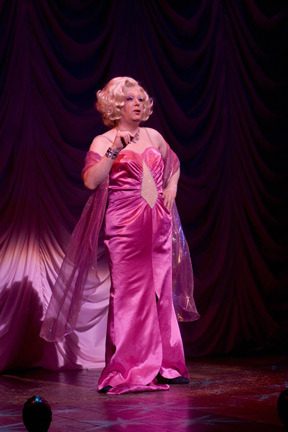 ‘Zaza’, the acclaimed transvestite diva of the fabulous show La Cage aux Folles which won the Tony award for Best Musical in 1984. 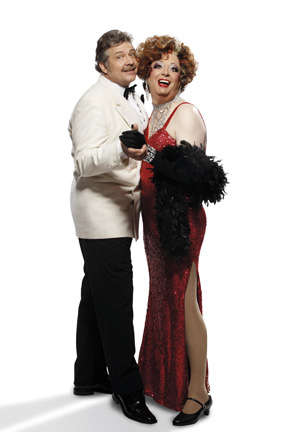 La Cage aux Folles owner Georges (Philip Quast) and his partner Albin (Roger Allam) who is also the transvestite diva Zaza, star of the club have been together, as a couple for nearly twenty years. They also have a twenty-four year old son, Jean-Michel, not just metaphorically speaking, as they raised him together, for his ‘real’ mother was half of an experimental one night stand Georges had with a chorus girl prior to meeting Albin, the love of his life. When Jean-Michel announces he is going to marry a girl named Anne (Alicia Davies), Albin wonders where he and Georges have ‘gone wrong’. But the real surprise is yet to come, for Anne’s father is the notoriously extreme right wing politician who is hell-bent on closing down clubs like La Cage and Anne’s parents are coming to meet her fiancés father and, mother. In terms of this particular production of La Cage one wonders where to begin with such a dazzling array of possibilities to choose from. The stars of this blinding show, Roger Allam and Philip Quast, are both marvellous in their roles, such is their individual and collective credibility and, charm. Allam as Albin a.k.a. Zaza delivers his bitingly funny lines with such acid wit and conviction that we are not only able to see, but also feel and empathise with the frailties beneath the feathered and sequined veil of his pseudo post-menopausal drama queen persona. Albin’s long term paramour, Georges is played with well practiced patience and good-natured warmth by Philip Quast, whom I’d last seen starring in a rather he - man role in South Pacific at the National Theatre. 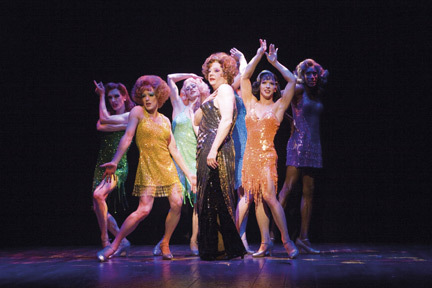 As Georges, Quast, like his partner Allam in his Zaza guise seems to take great delight in interacting with the audience in ways that serve to enhance that intimate cabaret feeling, such as spontaneous flirting with men seated down front, an aspect which is integral to the seemingly frivolous fun of La Cage aux Folles. It also has to be said that Jason Pennycooke, in the role of Jacob, the butler Georges hires who turns out to be a ‘maid’ offers one of the most riotous supporting performances ever, as evidenced by his comic unsteadiness in stilettos on stairs. (a phenomena many would empathise with) It may be true that sides can’t really split from laughter, but they are certainly sorely strained when laughing aloud as Pennycooke expertly puts the audience through the paces with his non-stop, high voltage preening and cavorting. The show’s star duo and their ‘hired help’ are supported by a gaggle of clapped out chorus ‘girls’ who simply have to be seen in action in order to be appreciated. Never have I witnessed such high kicking from such long legged dancers, and that’s really saying something considering the fact that I once grouped it to New York’s Radio City Music Hall to witness the famed Rockettes. Rather than being mechanised, in this show each dancers’ every gesture and movement, both facial and bodily seems to cry out, ‘I’m a star and nobody knows it but me,’ which, subsequently, imbues each performer with his own individual modicum of angst, making the group's ensemble routines the funniest and deliberately bawdiest ever. But there is not a weak performance in this glittering chain of events, as from beginning to end it is fast, funny and exuberantly full on! Yet the show’s wonderfully rollicking moments are counter-balanced with some beautifully understated ones generally instigated by Roger Allam as Albin/Zaza,, who even at this early date in his portrayal (since May 4) in the show’s proposed, lengthily run seems a sparkling shoe-in for an Olivier Award. However, every one of the players in this production, starring or supporting, does more than their fair share in order to assure that both the show and those watching it simultaneously reach hoped for high points, which materiallise, almost like magic, one after another. Rather than mention individual memorable moments in the show, which almost instantly, kept being replaced in my mind as the next scene and the next neatly unfolded into one another like a huge, feathered fan. Suffice it to say that the old adage, ‘Never a dull moment’ applies here, and then some. 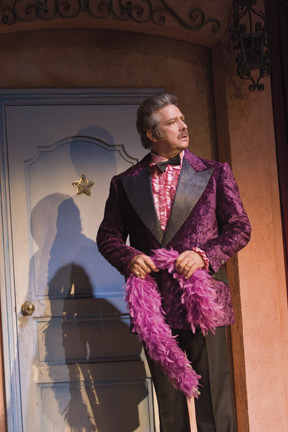 The show’s set designer, Tim Shortall also deserves much praise for his greatly evocative sets, which, alternately depict a Rivera seafront, complete with alfresco cafe, Albin/Zaza’s lived in dressing room with its myriad of photos, trinkets and sequinned gowns, and the stage of La Cage aux Folles itself. The backdrops of the club are sensational as well, with an oversized shimmering windmill backing up the dancers for one number, and a gigantic glittering heart behind Zaza for another. The show’s costumes by Matthew Wright are also out of this world, with a rainbow of colours and styles from bawdy to barely there reflecting the individual character of each and every chorus ‘girl.’ A whip-wielding, leather clad ‘German’ dancer was audibly appreciated by the Englishmen (and women) sitting around me. The lighting design also lends an adventuresome spirit thanks to Nick Richings, whose prism effect at one point is dazzlingly fanned out over a rainbow of sequin dressed dancers. The songs in this show are among the best I’ve heard in any musical and it was a wise decision on the part of composer, Jerry Hermann to reintroduce some of them intermittently, rather than to write a different number for each individual scene. By taking that approach, the impact of the songs are maximised with Georges son, Jean-Michel (Stuart Neal) for example, singing of his bride-to-be via the lovely, ‘With Anne on my Arm,’ and the same melody being utilised later, with slight lyrical variations by Georges (Philip Quast) as he sings ‘With You on My Arm’ to Albin/Zazu. The same is true of the show-stopping opening number, ‘We Are What We Are,’ which later translates into a very moving performance of ‘I Am What I Am’ by Allam in his stage persona Zaza. 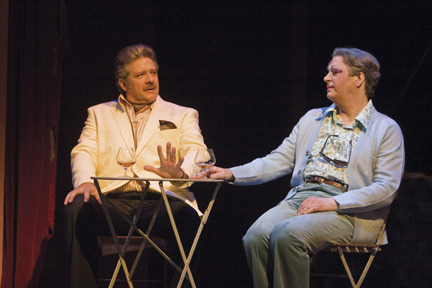 Quast also makes the most of his two emotive performances of ‘Look Over There,’ a beautiful song about appreciating those who truly love us. The reflective number, ‘Song on the Sand’, sung as a duet by Quast and Allam seemed to evoke wonderful memories for them, while it was also creating unforgettable moments for us.